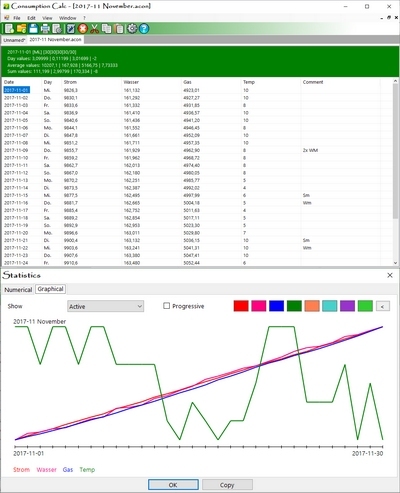 A simple program for capturing meter readings or consumption values. The data is captured for each month. Up to 8 values can be combined in one single file. The files may also be exported to CSV format which allos further editing in other programs (like Excel, Libre Office/ Open Office Calc). You may also combine several month-files into one with this program. It is compatible with the matching Android-version. The program is open source (Visual Studio 2017/C#). It requires the .NET-framework 2.0 (already included in operation system since Windows Vista). Download/Source-Code also available at SourceForge.